Petitioner Norma and respondent Ernst Johan contracted marriage in Holland. They were blessed with a son named Roderigo, who at the time of the filing of the instant petition was sixteen (16) years of age. Unfortunately, their marriage bond ended by virtue of a Divorce Decree issued by the appropriate Court of Holland. At that time, their son was only eighteen (18) months old. Thereafter, petitioner and her son came home to the Philippines. According to petitioner, respondent made a promise to provide monthly support to their son in the amount of Two Hundred Fifty (250) Guildene (which is equivalent to Php17,500.00 more or less). However, since the arrival of petitioner and her son in the Philippines, respondent never gave support to the son, Roderigo. Not long thereafter, respondent came to the Philippines and remarried in Cebu City, and since then, have been residing thereat. Petitioner, through her counsel, sent a letter demanding for support from respondent. However, respondent refused to receive the letter. Because of the foregoing circumstances, petitioner filed a complaint affidavit with the Provincial Prosecutor of Cebu City against respondent for violation of Section 5, paragraph E(2) of R.A. No. 9262 for the latter’s unjust refusal to support his minor child with petitioner. Thereafter, the Provincial Prosecutor of Cebu City issued a Resolution recommending the filing of an information for the crime charged against herein respondent with the RTC-Cebu. Thereafter, petitioner filed her Motion for Reconsideration thereto reiterating respondent’s obligation to support their child under Article 195 of the Family Code, thus, failure to do so makes him liable under R.A. No. 9262 which "equally applies to all persons in the Philippines who are obliged to support their minor children regardless of the obligor’s nationality." The RTC-Cebu issued an Order denying petitioner’s Motion for Reconsideration. Hence, the present Petition for Review on Certiorari. Does a foreign national have an obligation to support his minor child under our Philippine Law? A foreign national has an obligation to support his minor child. Petitioner cannot rely on Article 195 of the New Civil Code in demanding support from respondent, who is a foreign citizen, since Article 15 of the New Civil Code stresses the principle of nationality. In other words, insofar as Philippine laws are concerned, specifically the provisions of the Family Code on support, the same only applies to Filipino citizens. By analogy, the same principle applies to foreigners such that they are governed by their national law with respect to family rights and duties. The obligation to give support to a child is a matter that falls under family rights and duties. Since the respondent is a citizen of Holland or the Netherlands he is subject to the laws of his country, not to Philippine law, as to whether he is obliged to give support to his child, as well as the consequences of his failure to do so. In international law, the party who wants to have a foreign law applied to a dispute or case has the burden of proving the foreign law. In the present case, respondent hastily concludes that being a national of the Netherlands, he is governed by such laws on the matter of provision of and capacity to support. While respondent pleaded the laws of the Netherlands in advancing his position that he is not obliged to support his son, he never proved the same. It is incumbent upon respondent to plead and prove that the national law of the Netherlands does not impose upon the parents the obligation to support their child (either before, during or after the issuance of a divorce decree). In view of respondent’s failure to prove the national law of the Netherlands in his favor, the doctrine of processual presumption shall govern. 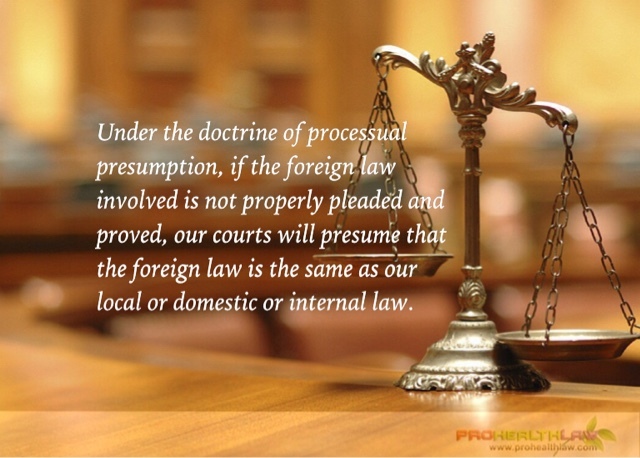 Under this doctrine, if the foreign law involved is not properly pleaded and proved, our courts will presume that the foreign law is the same as our local or domestic or internal law. Thus, since the law of the Netherlands as regards the obligation to support has not been properly pleaded and proved in the instant case, it is presumed to be the same with Philippine law, which enforces the obligation of parents to support their children and penalizing the non-compliance therewith. Such obligation is still duly enforceable in the Philippines because it would be of great injustice to the child to be denied of financial support when the latter is entitled thereto. NORMA A. DEL SOCORRO, for and in behalf of her minor child RODERIGO NORJO VAN WILSEM,Petitioner, vs. ERNST JOHAN BRINKMAN VAN WILSEM, Respondent.